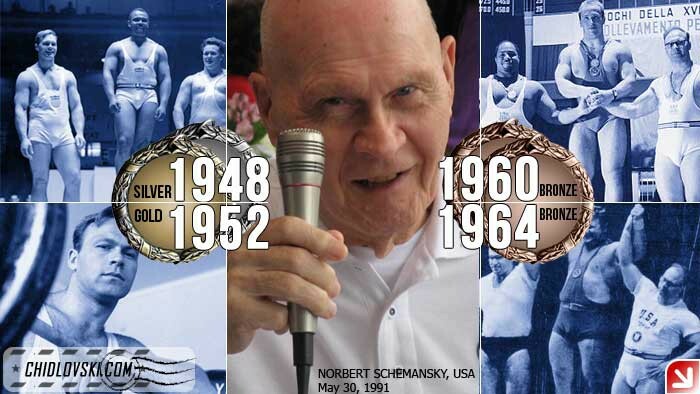 World famous Olympian, Norbert Schemansky celebrated his 91st birthday in Livonia, MI. Norbert Schemansky is a legendary athlete. He is one of the best U.S. Olympic weightlifters ever to represent the country at the Summer Olympics. During his long and successful career in sports, he won gold medal at the 1952 Olympics in Helsinki, silver medal at the 1948 Olympics in London and two bronze medals in 1960 in Rome and in 1964 in Tokyo. He authored 13 world records, won 3 world championships. He was a member of a legendary US weightlifting team of Bob Hoffman. Schemansky faced considerable competition at every meet. His battles with his Soviet counterpart, Yuri Vlasov, are the stuff legends are made of. Indeed, he faced formidable challenges off the platform. He underwent two major back surgeries. After his second, his doctors told him that he would be lucky to walk again, but he made a full recovery and went on to win a Bronze medal at the age of thirty-eight. Eventually, the years caught up with him: it became increasingly difficult for Schemansky to beat lifters fifteen years younger and forty or more pounds heavier than him. In 1972, after twenty-six years of weightlifting, injury forced the old master into retirement. In terms of recognition and financial security, there is a big difference between the Olympians of the past and today. Prior to the Summer Olympics in 1952, Norbert asked his employers at the Briggs Manufacturing for a time off. He left and managed to win gold Olympic medal in Helsinki. He came back home without a job and very little publicity about his heroic performance at the Olympics. One might find it ironic that Norbert Schemansky was more known overseas than in his own country. With all these said, on the record, the name of Norbert Schemansky appears more often in the history books of the Olympics than the names of such brand name athletes as Gordy Howe or Wayne Gretzky, Michael Jordan or Muhammad Ali, Tom Brady or Tiger Woods. Sports experts and fans definitely appreciate all the dedication and fantastic performance in sports by Norbert Schemansky. As part of the Lift Up project, we were proud to send our congratulations to the legendary champion. The warmest wishes were sent to Norb from all over the world during our Norbert Schemansky Marathon organized for his 91st birthday. The photos on the mini-report from the birthday celebration in Livonia are courtesy of Karen Sherman Ketover. Special thanks also to Karen for an opportunity to share our wishes with Mr. Norbert Schemansky.